We offered high quality Karanja Cake that is used extensively in many industries. 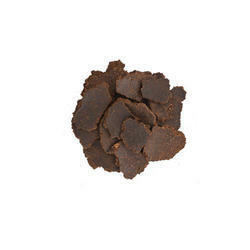 The karanja cake is the residue after extraction of oil from the pongamia or karanjia seed. The karanja cake is a good organic fertilizer and can be mixed with neem cake to control soil borne pests or insects including nematodes. We have established ourselves as a renowned manufacturer and supplier of Karanja Cake. Karanja cake pongamia glabra popularly known as karanj belongs to the family leguminous and is a medium sized glabrous tree capable of growing under wide range of agroclimatic condition. It is a pure karanj cake, which is manufactured by specially developed expeller technology to retain maximum karanjin intact in the cake. The karanja tree (pongammia glabra syn pongammia pinnate) can be seen throughout India and these are popularly known for their medicinal properties and it is traditionally used for about thousand years. Karanja cake contains high N-P-K values and it is really an excellent organic fertilizer. It is ideal for horticulture, floriculture and other high value crops.